Peyton Manning was named for the fifth time as the NFL MVP following his record setting regular season. No other NFL player has won more than three MVP awards. This season the Denver quarterback set single season records for most touchdown passes with 55 and passing yards with 5,477. Denver led the AFC with a 13-3 record and Manning was named on 49 of the 50 ballots. The one vote not cast for Manning was cast for Tom Brady the quarterback for the New England Patriots. Manning was named the league MVP while playing for the Indianapolis Colts in 2003, 2004, 2008 and 2009 and was runner-up in 2012 to Minnesota’s Adrian Peterson. In a video that was prepared in advance, Manning said he was humbled by the recognition received and was grateful to his family, Pat Bowlen the Broncos owner, John Fox the Broncos head coach, John Elway, the entire Broncos organization and his teammates. Manning was not on hand for the presentation. He is preparing for Super Bowl XLVIII that will be played today, Sunday February 2. In the video, Manning said he had sent his son Marshall and his father Archie to pick up his trophy. 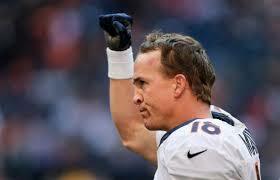 However, Manning trails athletes from other sports that have more total MVP awards. Wayne Gretzky the NHL great won nine MVP awards, Barry Bonds has seven MVP awards from Major League Baseball and in the NBA Kareem Abdul-Jabbar won six. Manning was also named the Offensive Player of the Year from the second time. Manning finished with 33 votes for Offensive Player of the Year with LeSean McCoy receiving 10 votes and Jamaal Charles receiving 4. The Carolina Panthers received two awards, with the NFL Coach of the Year being awarded to Ron Rivera and the top defensive player going to Luke Kuechly their linebacker. Rivera has engineered the turnaround by Carolina from 7-9 last season, to 12-4 and the NFC South Championship. Kuechly was key on a defense that gave up just 241 points, which was less than any other NFC team except Seattle, Denver’s opponent in today’s Super Bowl.